About a month ago I shared the work on a new fence in my side yard. Well, now I have an update with a fancied up fence. 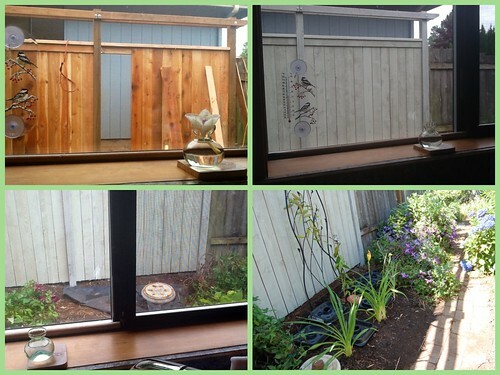 This is really the finished thing….fence, stain and plants. 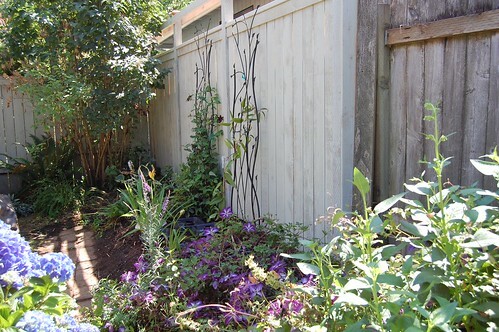 When we finished the fence construction, we thought we would retrain the two clematises that were there back up on the new fence. 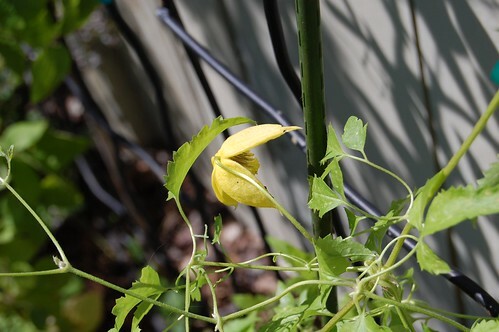 However, Niobi pouted and parts turned black on me….clematis wilt vs injured vines or both. Who knows. So, I pruned off the bad parts and did nothing with the other purple clematis which is now scrambling and blooming everywhere. I was afraid to plant the evergreen clematis which is destined to go where some clumping bamboo was, because I was afraid the bamboo might grow back. But, now quite some time after digging it up, I see no sign of bamboo. So we decided to take the chance and plant the clematis anyway. I hope I don’t regret this. Today was the big day and we worked to get a total of three clematises and three Daylilies into the ground. We amended the soil with some compost and filled in some low spots so the clematises wont sit in too wet a spot. I am exhausted, but I love the result. Above you see the fence as a work in progress…..the fence installation, getting the fence stained a light gray green, a view of how sad the empty spot in the ground was without any plants and poor Niobi in a heap on the ground, and finally the finished planting that we did today. Now for more of the finished bed. Evergreen Clematis and the three new Daylilies. These will shade the roots of the clematises when they mature. I covered the soil so my kitties won’t be tempted to make this into a litter box. Still looking for a little better covering. 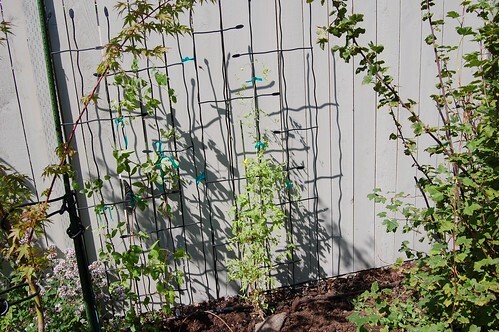 Here is the Evergreen Clematis with the trellis extension. This extension will let the purple clematis that is scrambling everywhere something to climb on. Closeup of my three new Daylilies. One daylily is a brownish orange, one is white and one I’m not sure of the color. We will see when it blooms. 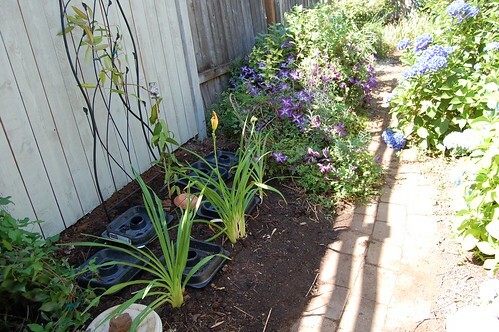 A look back at my new planting area with my told established clematises, Niobi and the purple one, along with the new Evergreen Clematis and my three new Daylilies. I even uncovered the walkway from all the dirt that had collected on top. We also got Clematis Romantika into the ground along our back fence right next to Helios. They should be a nice combination, as their bloom time overlaps a bit. Romantika is dark, dark purple. While Clematis Helios is beautiful lemon yellow. It should be stunning. And they are both planted near my dark elderberry. Love the contrasts. After it was all done, I had the panicked thought, “what if they like different soil conditions, which I had not checked out first. I thought the Daylilies would provide nice shading for the clematis roots, but had not done the former. To my relief, they play in more or less the same pH range. I have drip set up, so both will get adequate water. Now all I need to do is keep my cats from using this as a litter box. We put up some barriers to that, and I will keep an eye out on the kitties. 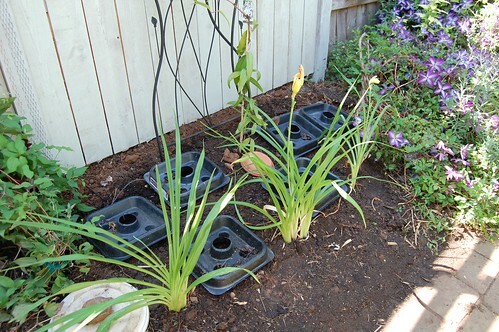 Now, I’ll just watch them grow in my garden, and thin out the Daylilies when they need it. I love the colour of the new fence. I can’t wait to see the plantings mature and fill out. It sounds like a lovely combination. Best of luck keeping those cats out of your newly planted section. Thanks for coming by. Yes, those pesky deer sure can make mincemeat of prized plants. We don’t usually have them here, but my previous home was another matter. Hope you have some good plants that deer don’t like or which you can protect. Hoping you have a good week. 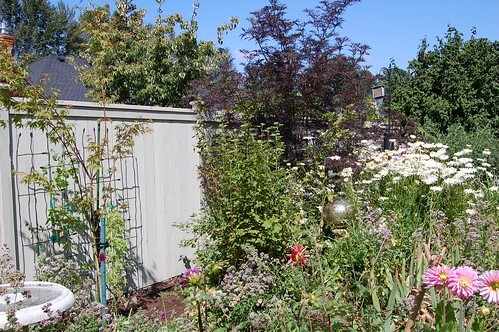 I love your new fence and the color you have chosen really makes the plants stand out. Isn’t it great when everything comes together so well? 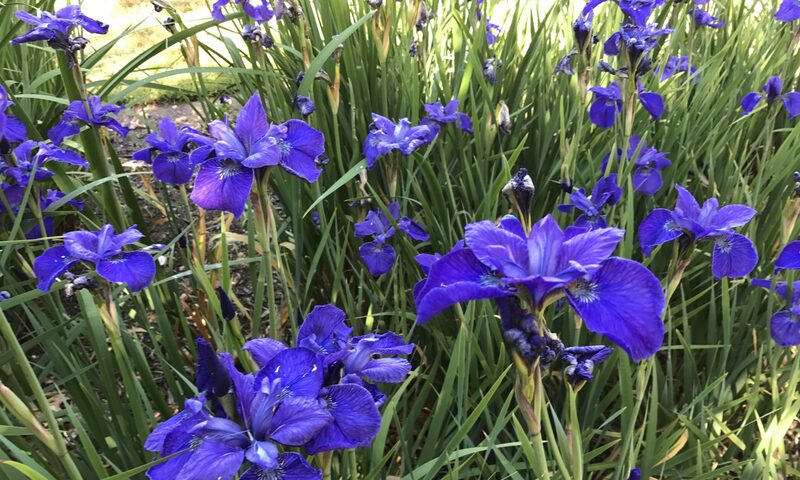 Enjoy your beautiful garden! Thanks. I was skeptical of the stain color at first. Now I love it and the way you can really see the plants now. Your new fence is lovely. What a garden! It must be a little piece of paradise for you. Thanks and thanks for coming by. It gives new life to this corner of the garden that had looked a jumble before. Thanks. We are very happy with it. Thanks for coming by and for your nice comment. We are enjoying it. Your garden has filled in rapidly. 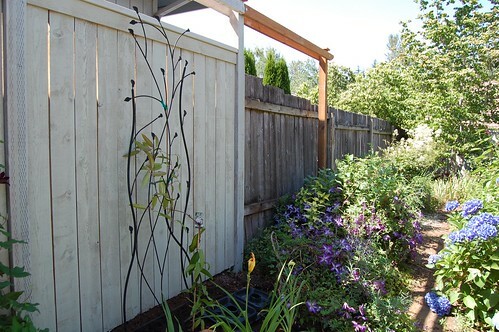 I love the shade of stain you selected–it’s a perfect backdrop for your gorgeous flowering plants! Thanks. I’m really psyched about this little area of the garden. We can see it right outside the kitchen window. You’ve made the oasis there! Thanks. And thanks for coming by. So far, we are enjoying this bed a lot. Can’t wait till the evergreen clematis grows up. Hoping that you have a good week. The fencing is so very nice! And the flowers will look so good once they are trained there. You’ve done a great job! Thanks for visiting me on Bloomin’ Tuesday. Thanks and thanks for your reply. We are very happy with it and cant wait until the clematis grows up.